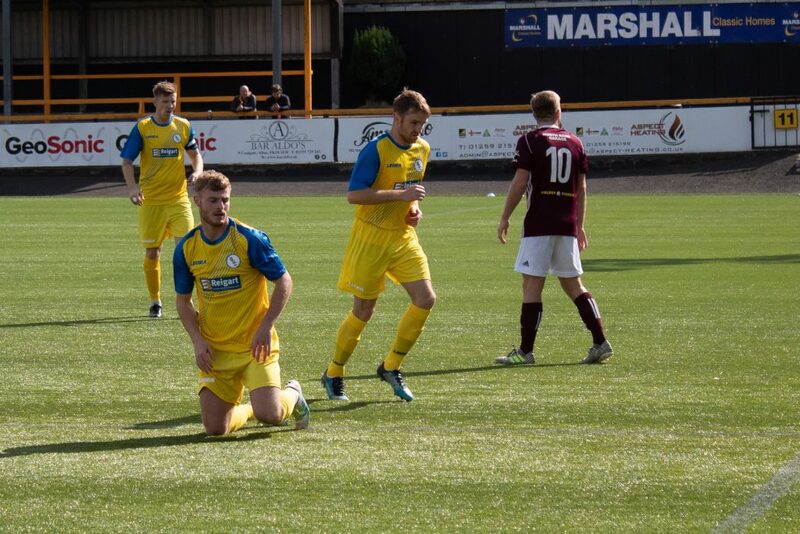 BSC Glasgow’s most recent loss is a tougher pill to swallow than most after they impressively came back from a 2-0 deficit only to concede a messy third goal. A few changes from manager Stephen Swift to the side that gained a point from Edusport; Robbie Duncan started, replacing John Tennent, Tam Orr replaced Martin Grehan and John Mitchell filled in for skipper Ross McMillan who was out for the weekend due to illness. Ross Smith took the captain’s armband. 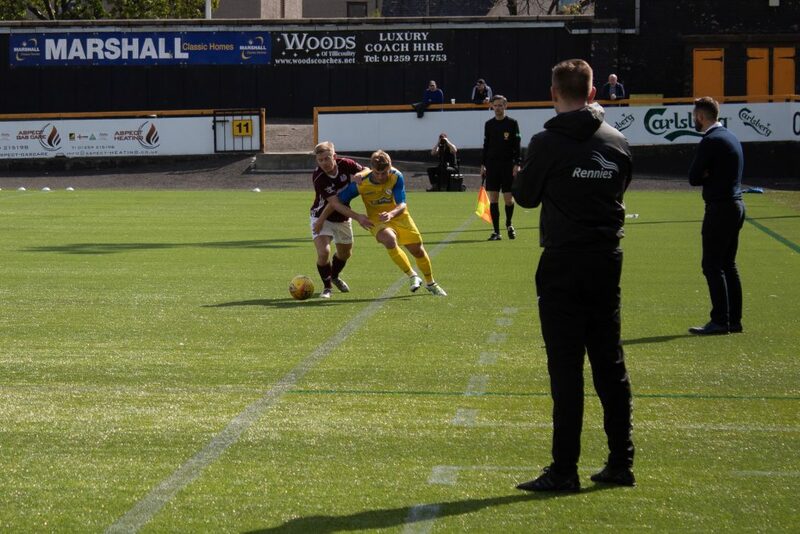 The opening minute proved Kelty’s attacking prowess when Ryan Marshall had to make a great save, however BSC almost capitalised on the counter when Jamie Mills pulled his usual routine of flying down the wing. The Fastest Man In The Lowland League (maybe) played a nice one-two with Adam Strachan only to have his powerful shot blocked and cleared for a corner. Great passing continued throughout the first half between Mills and Strachan as a nice set up led to a Ross Lindsay’s shot being curled just over the crossbar. 15 minutes in and fans at the Indodrill thought for sure, BSC would grab an early lead when Tam Orr rounded the Kelty keeper but took too long to take the shot as their back line managed to repair the damage quickly and clear the ball before the striker could get a shot away. It was in the 20th minute that BSC’s freshest misery begun. A Kelty free kick was whipped into the box and found the head of an in-form Stuart Cargill who grabbed an impressive first goal. Only three minutes later, another unchallenged cross found Cargill again who made it look easy for a header to slip past Ryan Marshall. Kelty fans at the Indodrill thought the win was surely in the bag with a 2-0 lead only 23 minutes in. BSC never let the lead affect them, however and charged forward immediately. Just after the half hour mark, Strachan seemed destined to get through the Kelty back four but was brought down in the box in a tangle of legs. Tam Orr converted from the spot for his fourth goal of the season (three of which have been penalties!). Swifty’s half-time team talk seemed to do wonder as BSC were charging up the flank in the opening ten of the second period. In the 53rd minute, Adam Strachan capitalised on a messy pass back to Kelty keeper Scott Christie. The winger intercepted the ball and worked himself into a position with an open goal at his mercy, however Christie made an incredible save to tip the ball onto the crossbar. The ball against landed at Strachan’s feet who, with an onslaught of Kelty’s back line rushing at him slipped the ball through the tightest of spaces for a huge BSC equaliser. The air of hope around the Indodrill lasted two whole minutes. A bizarre Ross Smith header, either a clearance or pass back, almost found its way into his own net. The ball bounced agonisingly off the post and Ryan Marshall almost managed to rescue it but Kelty striker Scott Dalziel charged in at the back post and got a toe on it for Kelty to take the lead again straight away. Substitutions of Stevie Murray, David Winters & Callum McKenzie didn’t make the impact Swifty would’ve hoped for as the game played out and BSC couldn’t get a solid grasp on any of the chances given to them in the last ten minutes.